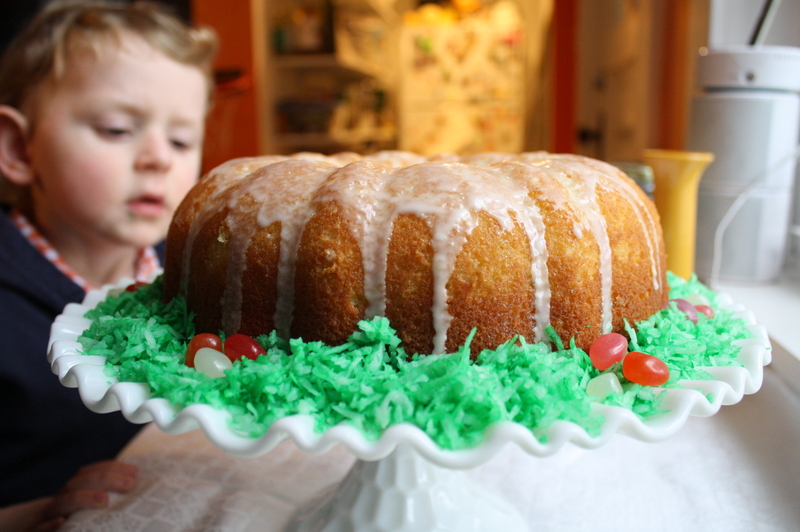 I’ve been on a serious cake baking hiatus lately because I haven’t personally had the appetite for one. I’m 19 weeks pregnant, and sweets are the last thing I’ve been wanting to eat. Plus, I’ve been super tired, so just getting dinner on the table every night has been the extent of my abilities. 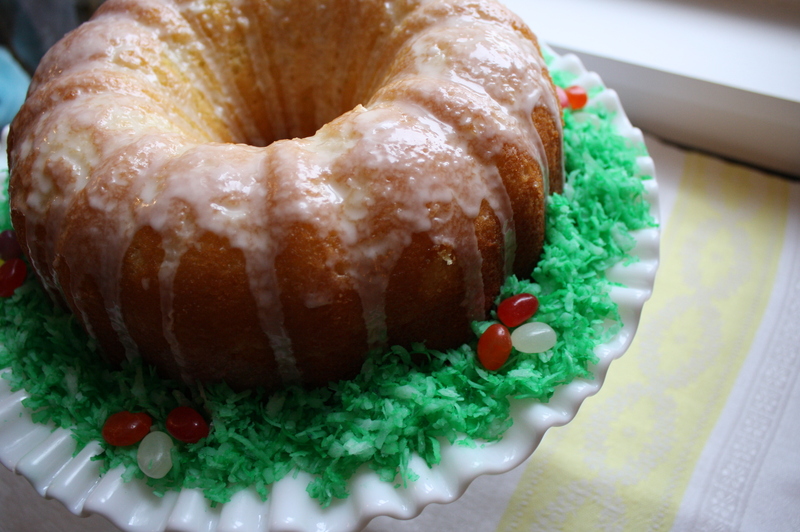 I’ve really been missing baking, though, so when someone asked me to make a cake for their Easter dinner, I jumped on it. This cake, another winner from one of my cooking heroes, Ina Garten, is one of the most lemony and buttery cakes you will ever have. 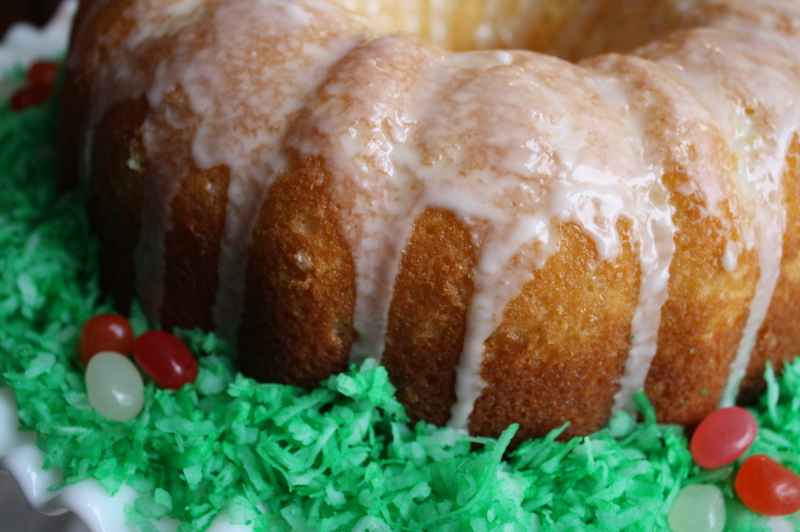 It has a moist pound cake texture, with bright, sweet lemony flavor. 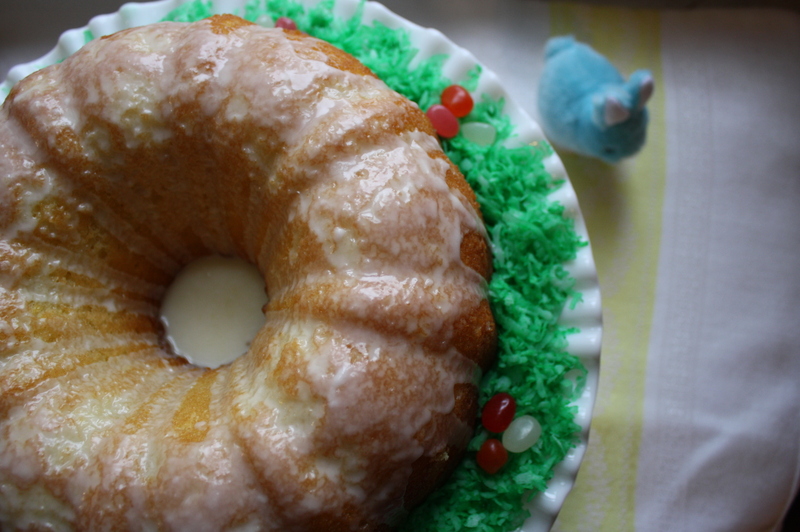 It’s pretty easy to make, and is great for company, like all bundt cakes are. I served it with raspberry sorbet, and the flavors were perfect together! It’s also, of course, great with vanilla ice cream. 1. Heat oven to 350 degrees F. Grease and flour two 8 1/2-by-4 1/4-by-2 1/2-inch loaf pans, and line the bottoms with parchment paper. If using bundt pan, spray with baking spray with flour JUST before pouring the batter in. This prevents the oil from pooling on the bottom. 3. Sift together flour, baking powder, baking soda and salt in a bowl. In another bowl, combine 1/4 cup lemon juice, buttermilk and vanilla. Add flour and buttermilk mixtures alternately to butter and sugar mixture, beginning and ending with flour. Divide batter evenly between pans, smooth tops, and bake for 45 minutes to 1 hour, until a cake tester comes out clean (I would check at 40 minutes…my cake was done at that point). 5. When cakes are done, let them cool 10 minutes. Poke holes in the top of the cakes (still in the pan) with a toothpick and spoon about 1/3 of the syrup over the cakes. Let sit for a few minutes. Invert them onto a rack set over a tray, poke with holes, and spoon rest of lemon syrup over cakes. Let cakes cool completely. 6. For glaze, combine confectioners’ sugar and remaining 3 1/2 tablespoons lemon juice in a bowl, mixing with a whisk until smooth. Pour over top of cakes, and allow glaze to drizzle down the sides. If needed, after about 10 minutes, brush more of the glaze that has pooled underneath over the cakes with a pastry brush. 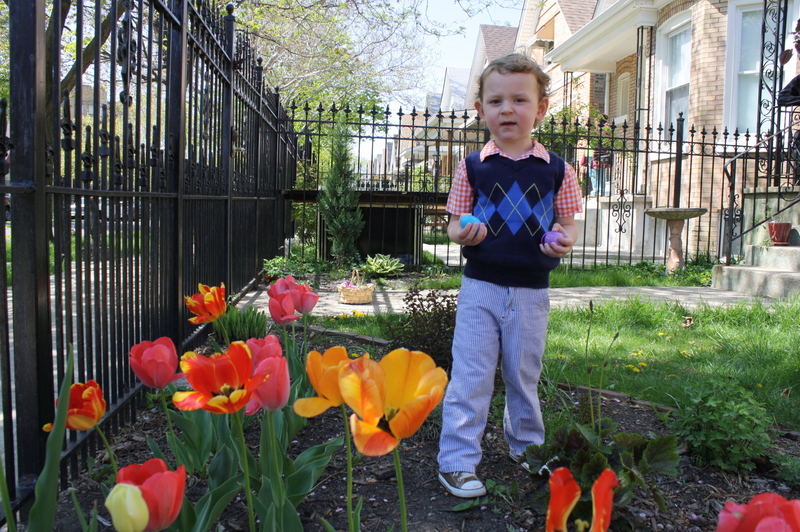 The blog and the photos make me smile!